A romantic European vacation is the perfect excuse to let go in this delightfully romantic, refreshingly modern, and highly anticipated sequel to No Love Allowed. 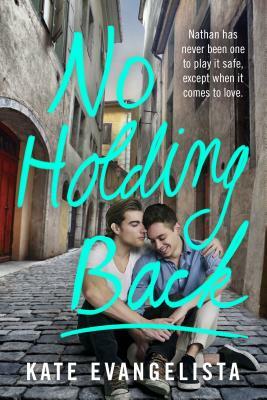 Fall in love with Nathan and Preston all over again in No Holding Back, the swoonworthy new young adult contemporary romance in the Dodge Cove Trilogy by Kate Evangelista. When Kate Evangelista, author of the Dodge Cove trilogy (No Love Allowed, No Holding Back, and No Second Chances), was told she had a knack for writing stories, she did the next best thing: entered medical school. After realizing she wasn’t going to be the next Doogie Howser, M.D., Kate wandered into the literature department and never looked back. Today, she is a graduate of De La Salle University—Manila with a bachelor of arts in Literature. She taught high school English for three years and was an essay consultant for two. She now writes full-time and is based in the Philippines.